The school year ending is always an exciting time; with the prospect of an endless summer, no more classes, not having to deal with idiotic people daily, more hobby time (hopefully), and being able to spend two solid months with my girls. It’s always a relief to begin a long vacation, despite loving my job. 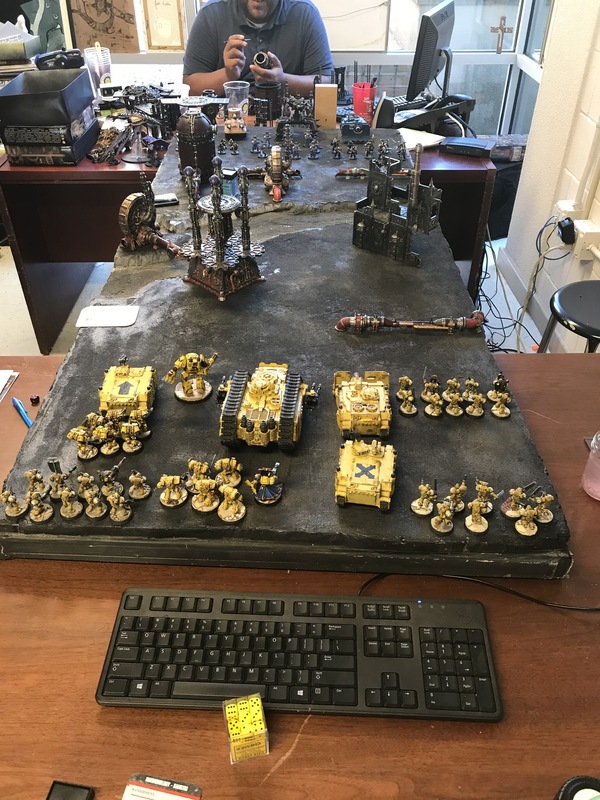 So, as time was a little more flexible in the last week of school, a senior student of mine challenged me to a 1850 point game (!!!). 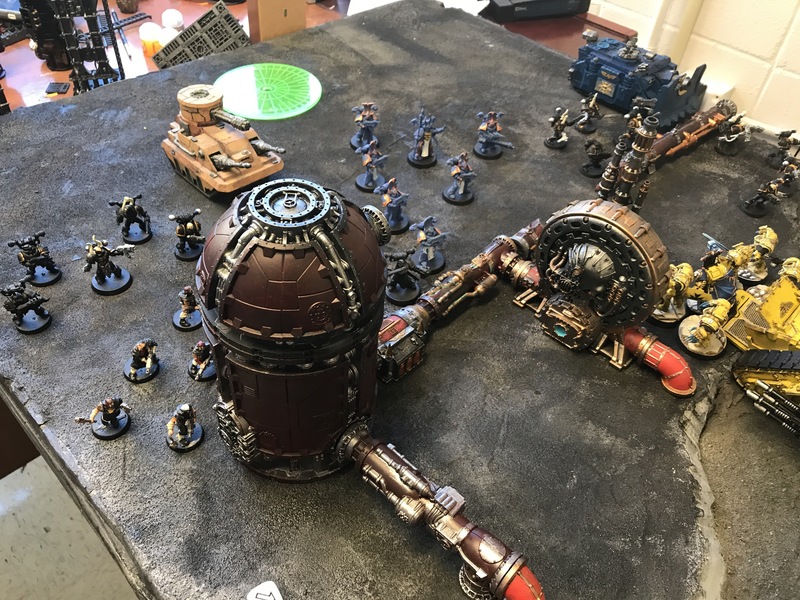 I was honored to accept, as I haven’t truly played since around Christmastime – I’m usually just moderating games and teaching the newer club members how to play with the soon-to-be-defunct 7th Edition rules. 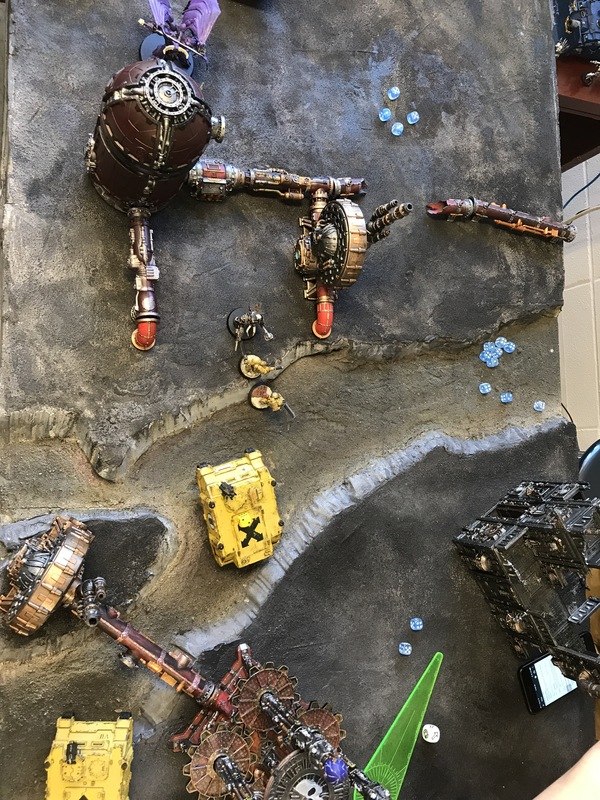 Naturally, I accepted the challenge, as this student is our resident Chaos worshipper, a mighty force of combined Black Legion and Thousand Sons. 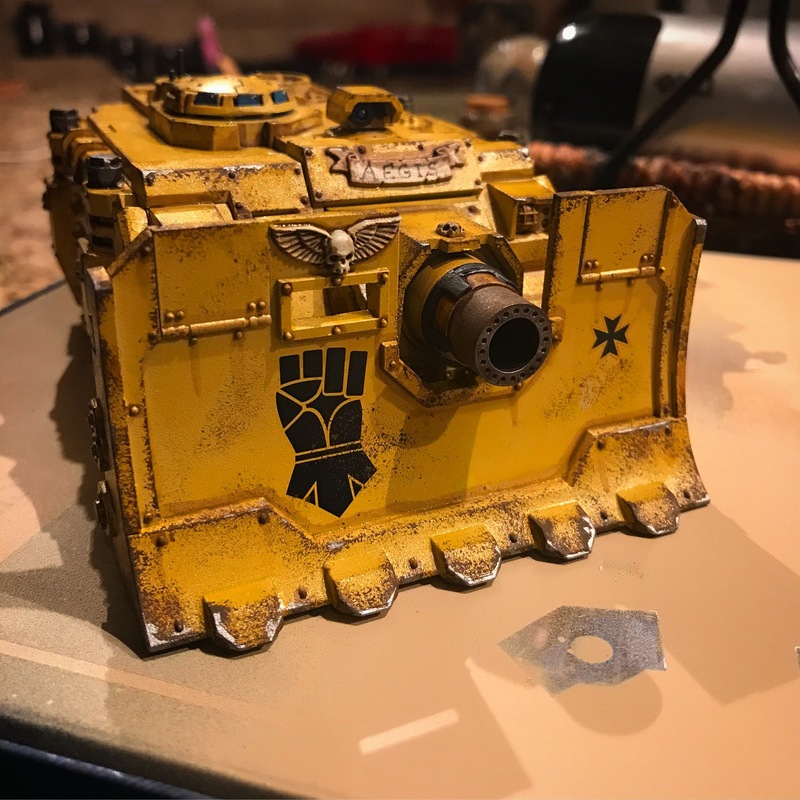 The Sons of Dorn would answer the call! I arranged one of our two 3×6′ table sections into a long stretch of industrial wasteland, and randomly decided on a board edge with a dice roll. Having ten minute breaks between classes and a 45 minute lunch break afforded me plenty of time to set up and decide on a force in the last days of school – as I had already completed my end-of-year checklist, it was nice to have a few moments to myself while other teachers were frantically rushing to finish their own tasks. The board was set, the books, templates (RIP), and dice were ready, all we needed to do was begin the next morning! 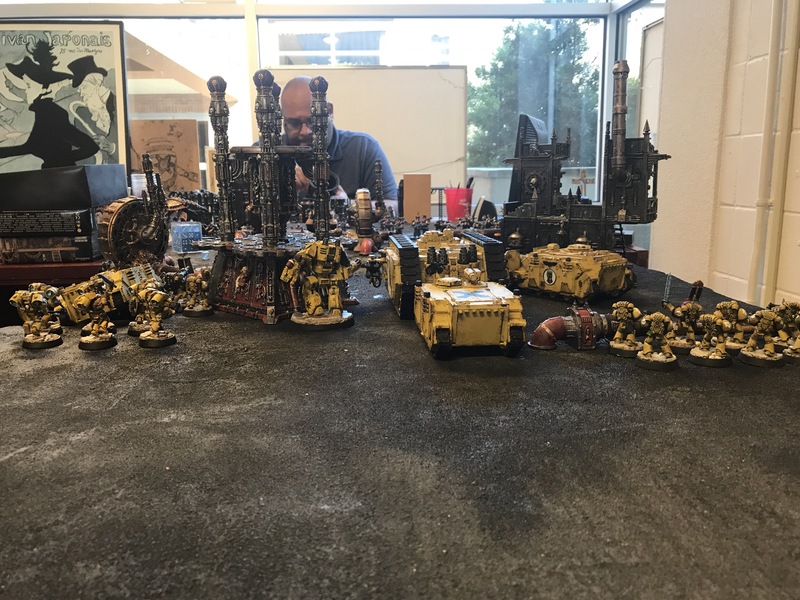 Below you can see my entire force that was brought to the match (with the chaos forces arrayed in the back, and my colleague painting some Shadow War terrain). Totaling in at 1849 points! 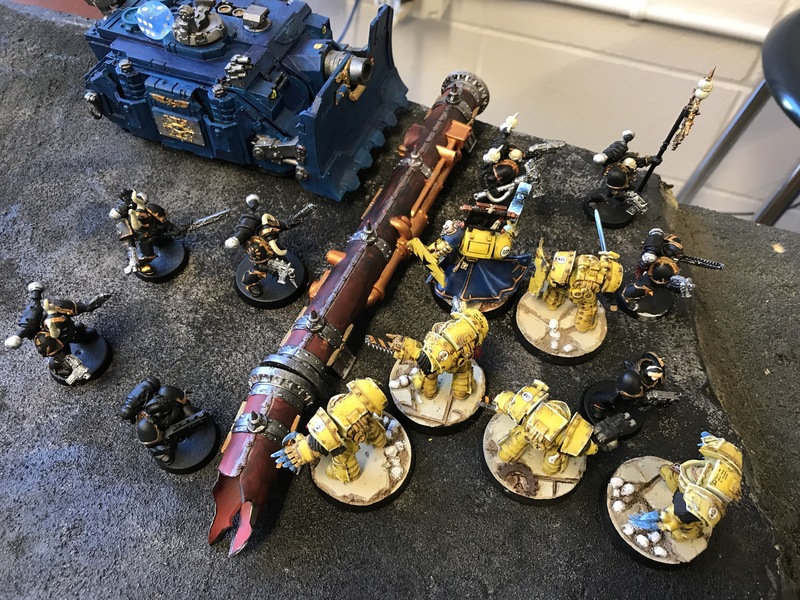 I snuck the Vindicator in after building, priming, and painting it in a matter of hours – I thought it would help thin out the Tzeentch terminators and even Magnus I would no doubt be facing! But, as Tzeentch’s fate would have it, Magnus didn’t even show up. Instead the traitor legions would be led by a mighty daemon prince, Karashiav, Bane of the Living – himself wielding the accursed Black Mace which would prove devastating against my sons of Dorn. Turn one movement. Charged ahead with all forces, the Spartan detonated the chaos defiler with its massed lascannon shots. The game went very well for me in the first couple turns. I landed many hits against enemy armor, blew up the defiler outright, and pressed the attack with my Vanguard and Assault squads. I kept the right flank secured with my tactical Squad hoping to hit the Heldrake with some Flakk missiles, but both it and and daemon prince took several turns to even show up. Overall I thought I had this one in the bag as a victory. 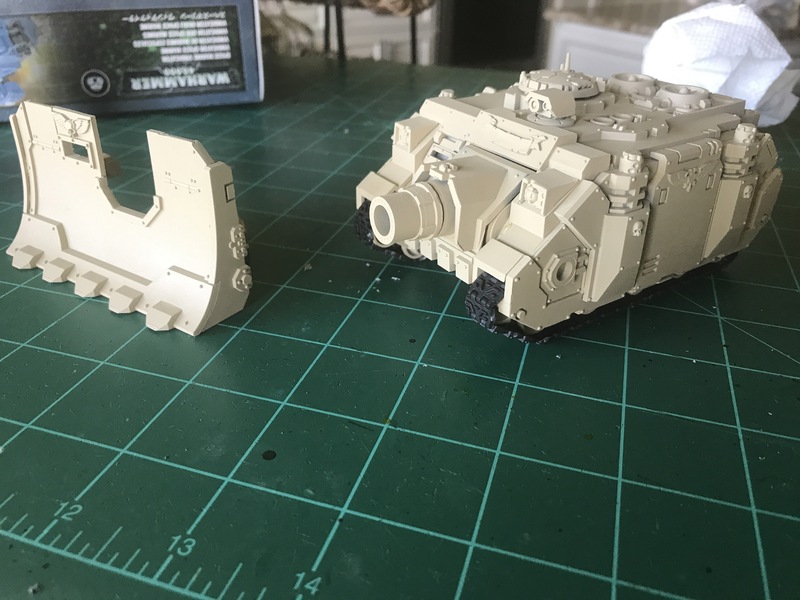 The chaos forces look a little sparse! That weird GI Joe looking thing is a “Predator,” don’t ask. Terminators and the Librarian charged forth from the Spartan, assault and Vanguard marines pushed the left flank, right flank held on as hard as they could. The Heldrake made it onto the field, and wound up vaporizing 19 of my 20 Tactical Marines in two turns. 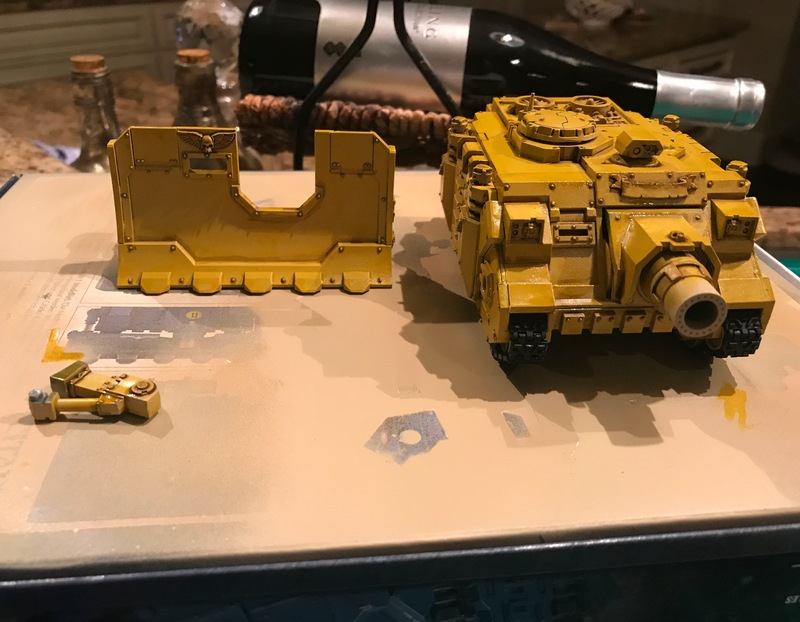 My Vindicator and Spartan eventually got melted, and things started to look grim! 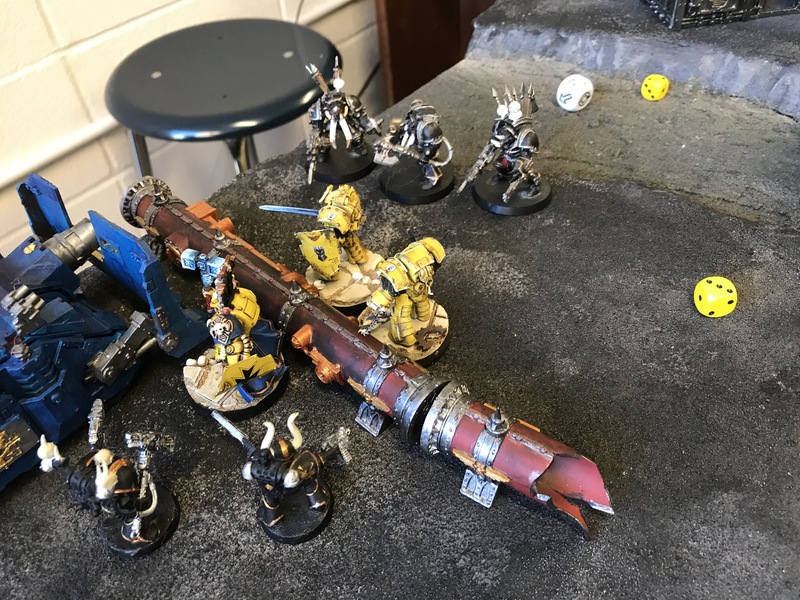 The Daemon Prince eventually made it onto the field – and my Librarian did the honorable thing and charged his force weapon and initiated a challenge! Which… ended poorly. The Vanguard Veterans sought to finish the job – also ended poorly. I’ve got to say that a daemon prince with the Black Mace is a terrible force to contend with. I’m curious to see how it changes in 8th Edition. Without all the boring details, just know that what states out as a solid Imperial advantage turned into a grueling battle of attrition down to the literal last man (daemon). 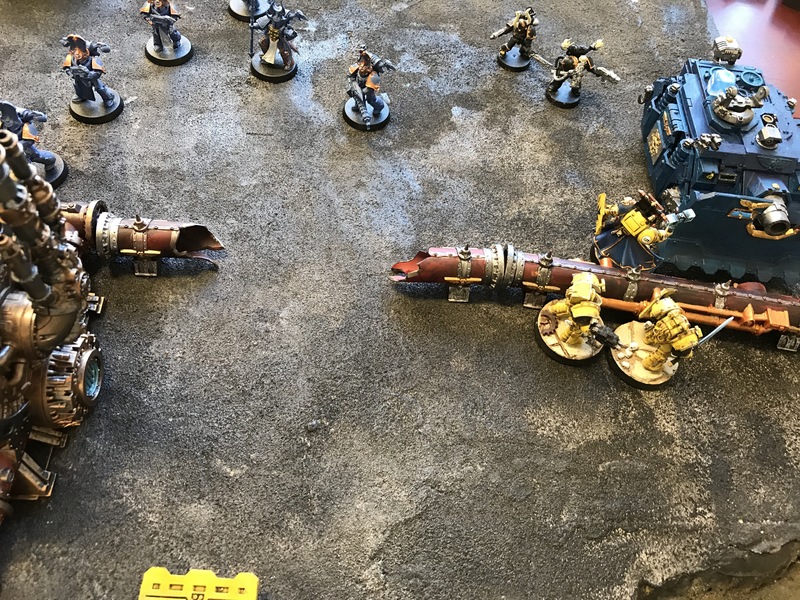 Here’s a picture of the last turn of the game, before the Imperial Fists were forced to withdraw! WE WILL HAVE OUR REVENGE!